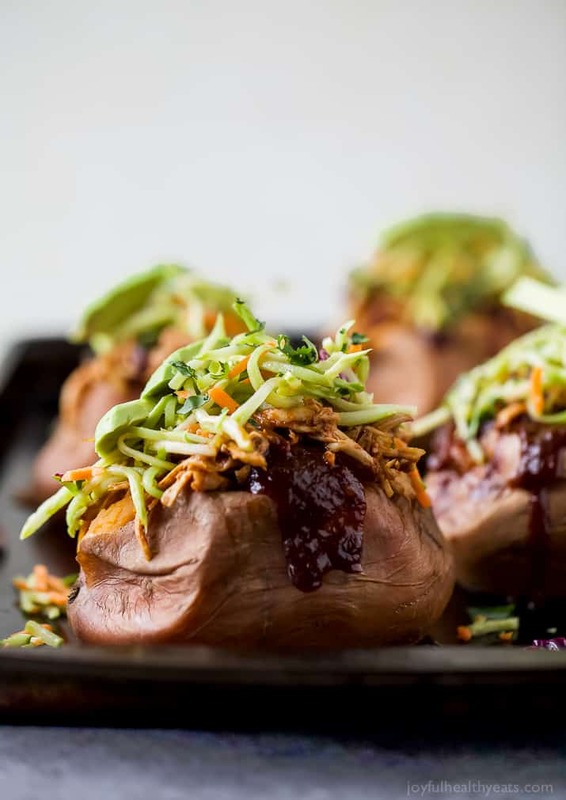 BBQ Chicken Stuffed Sweet Potatoes topped with Broccoli Slaw, an easy gluten free recipe perfect for a quick weeknight dinner! 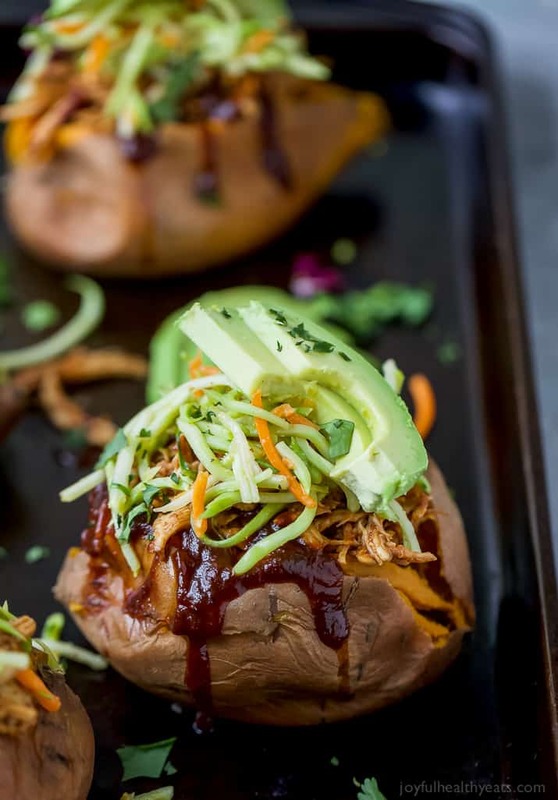 30 Minute BBQ Chicken Stuffed Sweet Potatoes topped with Broccoli Slaw. 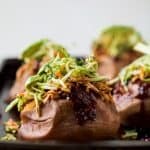 These Stuffed Sweet Potatoes are an easy gluten free recipe that’s perfect for a quick weeknight dinner! Guys. Wanna know something crazy. I just bought school supplies yesterday! Is it already that time of year? How did the summer go by so fast? I had so many things I wanted to do. One of them being, going to Florida as a family and hanging out at the beach. But I don’t think that’s going to happen this year. We were going back and forth on whether or not it would be “fun” to bring a 6 month old to the beach. Especially since she can’t really be in the sun until she’s 6 months. So I guess that’s next years plan. Hopefully we can find another couple to go with that has kids and will split the cost of an AIRBNB. Any takers? Since we are on the subject of school starting… ugh. I guess it’s that time of year for quick weeknight meals. Huh? 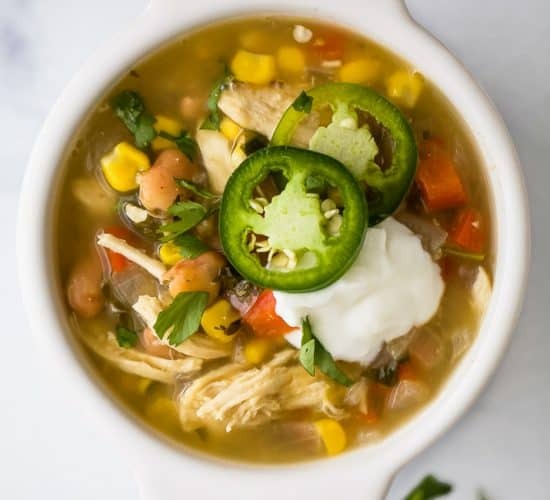 Would you guys want a roundup of a bunch of weeknight meals so you’re ready for the school year? Or just keep the good recipes flowing? Give me a shout and let me know. Today’s recipe definitely fits that quick weeknight meal category. 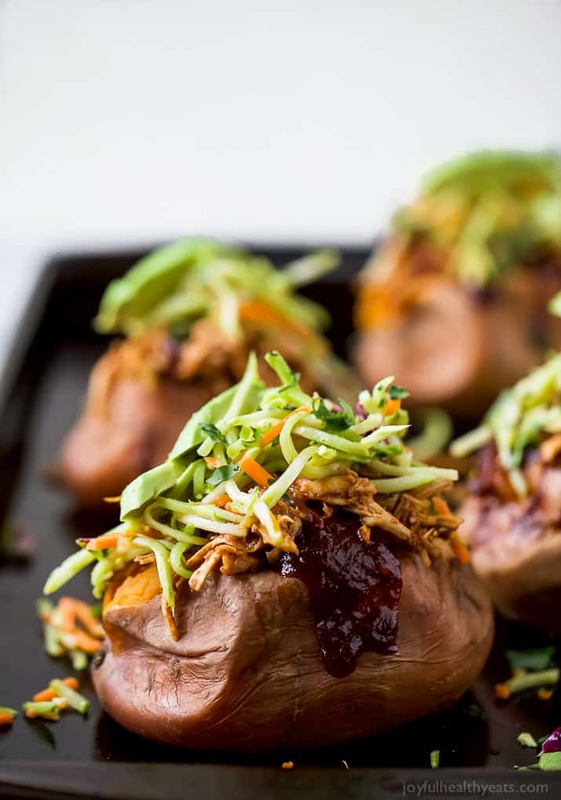 BBQ Chicken Stuffed Sweet Potatoes topped with an easy Broccoli Slaw. You’ll love the short cuts I take so that these stuffed sweet potatoes are on the table in less than 30 minutes! The first short cut is using Rotisserie Chicken. Guys it’s already cooked! All I do is tear the white meat part off (I don’t use the dark) shred it and then toss it with some BBQ Sauce. BBQ Chicken part… done. Then I wash off my sweet potatoes. Stab them a couple times. 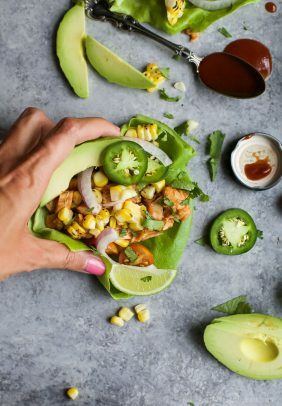 Wrap them in paper towel and put them in the microwave to cook. I just pressed the “baked potato” option and let it go. But I understand some of you might not have that, so just cook it on HIGH for 5-8 minutes (depending on size). Potato part… done. Then for the slaw part I bought packaged broccoli slaw and add a quick vinaigrette to it. Instead of a cream based I did more vinegar based so it balances out of the sweetness from the BBQ sauce and sweet potatoes. That way it doesn’t feel so heavy on your tummy. So as you can see, not only is this recipe ridiculously easy to make. It’s loaded with flavor and textures. 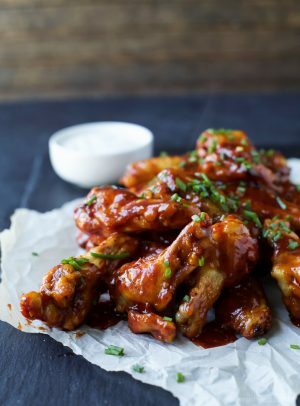 Definitely a winner when it comes to those quick easy dinner recipes. I hope you guys enjoy it as much as we did. Wash sweet potatoes with water. Poke with a knife 5-6 times. Then wrap each individual sweet potato with paper towel so they are completely covered, no skin showing. Place the sweet potatoes in the microwave and cook on HIGH for 5-8 minutes. Or until tender. Set aside and let cool. 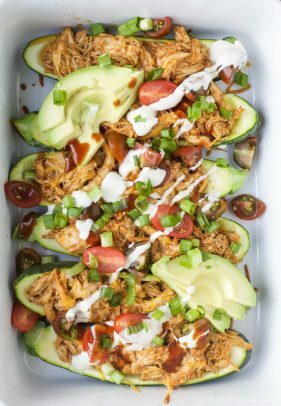 In the meantime, to a medium bowl add shredded chicken and bbq sauce. Using a fork mix the sauce in until the chicken is completely coated. Set aside. To a small bowl add mustard, honey, garlic powder, smoked paprika, apple cider vinegar, olive oil, salt and pepper. Whisk until emulsified and the vinegar no longer separates from the oil. To another medium bowl add broccoli slaw. Pour the dressing over the slaw and toss to coat everything. Assemble. 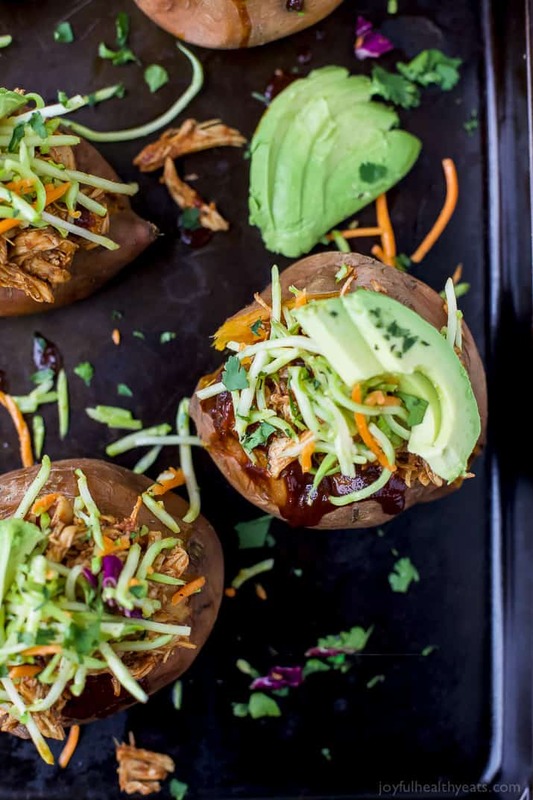 Slice a sweet potato down the middle and fill it with bbq chicken then top with broccoli slaw and sliced avocado. Repeat for each sweet potato and serve! 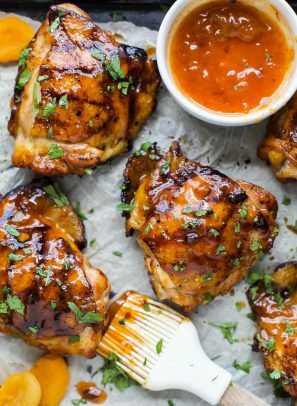 Want More BBQ Chicken Recipes? 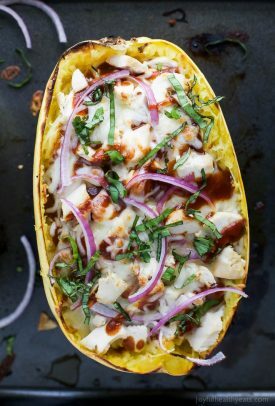 Such a great idea to load it all on a sweet potato! Looks fantastic! What a great way to enjoy a sweet potato! I have to try this out! You totally had me at sweet potatoes. Seriously nothing is better than that! Such a great idea! Looks so good! 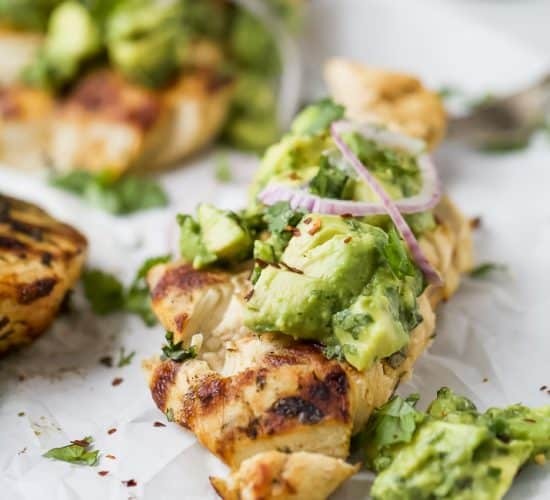 Can always use more quick and easy weeknight dinners like this! Looks to be a dinner repeat for sure! Baking or roasting sweet potatoes really brings out their naturally sweet flavor. 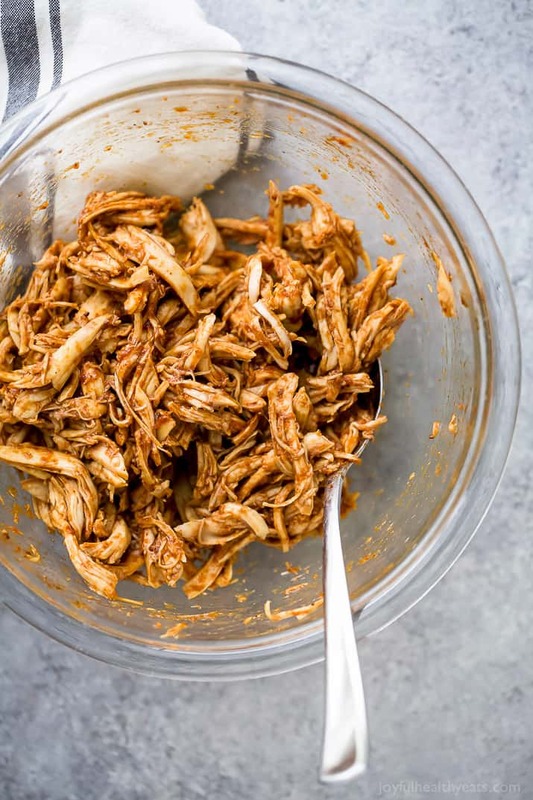 And rather than cooking the chicken myself, I picked up a prepared rotisserie chicken from the grocery store, shredded it, then added my favorite barbecue sauce to it. Look so tasty! This needs to happen at my house very soon!! I am sure this will be a sure hit in my house! Such a great idea!